Don’t miss the Duel, get your tickets today. We know you’ll have a great time with us, and best of all, 100% of proceeds stay local, benefiting the farming communities of Shawano, Waupaca, and Outagamie counties. To download the 2019 event poster (PDF), click HERE. N.E.W. 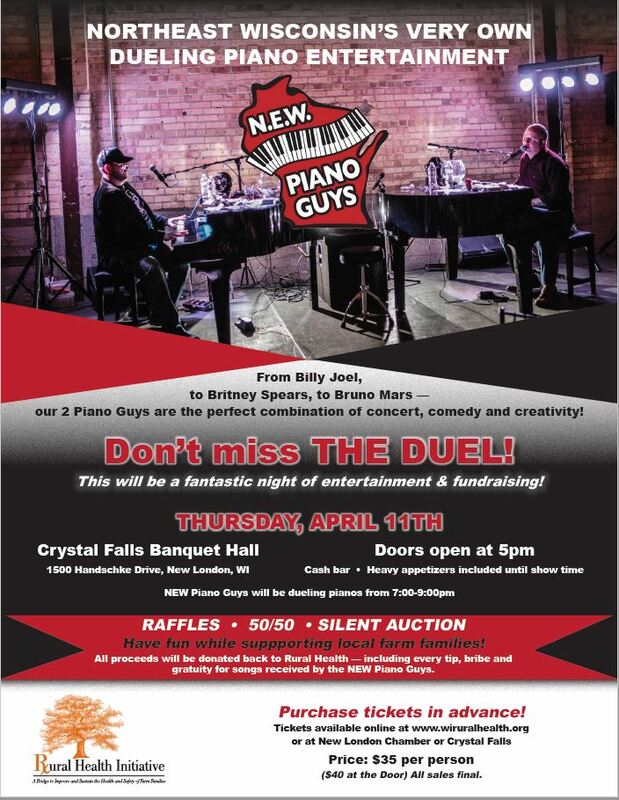 Piano guys will be dueling from 7:00 until 9:00 pm. From Billy Joel to Brittney Spears to Bruno Mars- N.E.W Piano guys are the perfect combination of concert, comedy and creativity! Raffles, 50/50, Silent auction. All proceeds will be donated back to the Rural Health Initiative- including every tip, bribe and gratuity for songs. Purchase tickets at New London Chamber office, Crystal Falls Banquet Hall or online (convenience fee automatically applied) www.wiruralhealth.org . If you purchase tickets online, tickets will be mailed to you using the address you provide during check-out. Direct any questions to Rhonda Strebel at (715) 524-1488. Hearty appetizers prior to show. Gather up some friends and join us for an evening of fun! Join us for our 3rd annual themed Big Daddy D Productions dinner show—guaranteed to be a great night out for funny, clean entertainment, and all for a great cause. 5:00PM: Social hour, with Cash bar. 6:00PM: Family-style chicken and tips—served with potatoes, dressing, vegetables, dinner roll and butter, milk and coffee. 6:45PM: Video & Donation Challenge. Chance to win $500 Shopping spree at Senzig’s Fine Home Furnishings in Shawano. 7:00PM – 9:00PM: Hollywood Hits variety show begins, including soundtracks from some of our favorite movies, and clean comedy. Approximately halfway through, there will be a 15 minute intermission, donation challenge winner announced, and 50/50 drawing (optional). The show concludes with a veterans salute. Family-style chicken & tips. Served with milk and water. Cash bar available for additional beverages. Click HERE (pdf) to view, download or send it to a friend. 100% of proceeds go directly back into the Rural Health Initiative to provide complimentary Kitchen Wellness to local farmers, agriculturists, agronomists, and anyone else who contributes to agriculture within Shawano, Outagamie and Waupaca Counties. Romy’s is located at W5670 County Rd A, Black Creek, WI 54106. Romy’s is known for its welcoming atmosphere, friendly owners, and delicious food. For directions, click HERE. Daddy D Productions has entertained thousands of Wisconsinites with their tasteful comedy, talented performers, and abundance of energy. It’s a perfectly concocted combination that has kept guests coming back for more. Every show provides something new and is sure to keep you entertained. The Rural Health Initiative is a 100% community-supported local non-profit. Your purchase to the dinner show assists with the program’s sustainability. To learn more about the Rural Health Initiative, click HERE. We’ve another great wine & cheese tasting planned for you, so get your tickets today. We know you’ll have a great time with us, and best of all, 100% of proceeds stay local, benefiting the farming communities of Shawano, Waupaca, and Outagamie counties. To download the 2018 event poster (PDF), click HERE. Cheese Fondue. The Outagamie and Waupaca County Dairy Promotions are featuring four kinds of cheese fondue for you to get your dip on! Purchase tickets in-person at Festival Foods (New London location only) or online (convenience fee automatically applied). If you purchase tickets online, tickets will be mailed to you using the address you provide during check-out. Direct any questions to Rhonda Strebel at (715) 524-1488. 1 for $40, or purchase more and save! Silent Auction. Be the highest bidder to take home our one-of-a-kind items. Money Tree. Sponsored by Premier Community Bank, you’ll have a 1 in 54 chances to win at least $200. Lucky Udders. Be holding the winning “Udder” (paddle stick) for a chance to take home some moola. Effective February 14, 2018 at 10:00PM, the event is sold out. No tickets will be sold at the door. Cheese Fondue, complementary of Shawano Area Dairy Promotions Group—4 kinds of cheese fondue for you to get your dip on! Purchase tickets at Premier Community Bank in Shawano or online (convenience fee automatically applied). If you purchase tickets online, tickets will be mailed to you using the address you provide during check-out. Direct any questions to Rhonda Strebel at (715) 524-1488. 1 for $35, or purchase more and save! Win two (2) airline tickets! Silent Auction. Be the highest bidder to take home our one-of-a-kind items. Green Bay Packer autographed footballs, local sports tickets, hand-crafted wooden items — and more. Join us for our 2nd annual themed Daddy D Productions dinner show—guaranteed to be a great night out for funny, clean entertainment, and all for a great cause. 5:00PM: Social hour with entertainment provided by Gizmo, the illusionist. Cash bar. 6:00PM: Family-style chicken and tips—served with vegetables, dinner roll and butter, milk and coffee. 7:00PM – 9:00PM: Country Classic variety show begins, including hits from the 50s, 60s, 70s and clean comedy. Appromximately halfway through, there will be a 15 minute intermission and 50/50 drawing (optional). The show concludes with a veterans salute. Call the Rural Health Initiative at (715) 524-1488 or purchase online at the RHI Store. Doxbee’s is located at N6744 County Rd C, Seymour, WI 54165. Located just a 15-minute drive from either Green Bay or the Fox Cities, Doxbee’s is known for its welcoming atmosphere, friendly owners, and delicious food. For directions, click HERE. The Rural Health Initiative is a 100% community-supported local non-profit. Your purchase to Jukebox Jive assists with the program’s sustainability. To learn more about the Rural Health Initiative, click HERE. Join us for another fun-filled evening that supports a great cause – the local farming communities of Shawano, Waupaca, and Outagamie counties. Soda pop samples from Pigeon River Brewing! Download the 2017 event poster (PDF) HERE. First State Bank, Larsen Cooperative, Waupaca Dairy Promotions, Quantum Dairy LLC, and GreenStone Farm Credit Services. Purchase tickets in-person at Festival Foods (New London location only) or online. Cost (per admission ticket)—on sale NOW! • $35 at the door (event night), until capacity is met. Click HERE to view, download (PDF) or send it to a friend. …and all the water, soda, and chocolate milk your heart desires! Silent Auction. Be the highest bidder to take home our one-of-a-kind items. Green Bay Packer autographed football, local sports tickets, hand-crafted wooden items — and more. Money Tree. Sponsored by Premier Community Bank; 1 in 54 chances to win at least $200. Gather up some friends and join us for a evening of fun! Call Rhonda at (715) 524-1488 or complete the form below. Don’t delay to get your tickets. Last year’s event sold out in advance, before doors even opened! Join us for another fun-filled evening that supports a great cause – the local farming communities of Shawano, Waupaca, and Outagamie counties. • $30 in advance & in-person at the following locations: Premier Community Bank (Shawano location only) or stop at the Rural Health Initiative office — located inside ThedaCare Physicians – Shawano, 2nd floor. • $32 online. Click HERE or click RHI Store from the menu above. Thank you to Green Valley Dairy, United Cooperative, Ardex All American Minerals, Shawano Area Dairy Promotions, and Charlie’s County Market. Learn how we can work together and connect our resources to expand the Health Literacy group to serve the greater Shawano area. Join the conversation. Share your ideas. Complimentary cookies and hot cocoa will be served. There is NO charge for this event. Invite friend or colleague, too! Event Sponsored by ThedaCare Medical Center – Shawano Health Resources and Services Administration (HRSA) grant and local consortium members. Join us for our 1st annual themed Daddy D Productions dinner show, Jukebox Jive, on Thursday, October 6, 2016 from 6:00PM – 9:00PM at Doxbee’s in Seymour. All proceeds benefit the Rural Health Initiative to continue its mission within Outagamie County. Each admission ticket includes dinner, milk, coffee, and a clean comedy entertainment show by crowd favorite Daddy D Productions. Entertainment graciously sponsored by Milk Source, LLC. Thank you. If ticket is purchased online, a $2.00 convenience fee per ticket is applied. 5:00PM: Social hour. Cash bar. 6:00PM: Dinner, served family style. Dinner includes two choice of meat, vegetables, dinner roll and butter, milk and coffee. 7:00PM – 9:00PM: Themed Jukebox Jive variety show begins, including hits from the 50s, 60s, 70s and clean comedy. Appromximately halfway through, there will be a 15 minute intermission and 50/50 drawing (optional). The show concludes with a veterans salute. Choose to Move 5K Series. Choose 1, choose all 3. It’s your choice. Outagamie County Breakfast on the Farm a success! Over 60 walkers and runners from local communities joined us for a gorgeous morning. Waupaca County Fair a success! Shawano County Fair a success! Mark your calendars. Get your tickets today. Join us for a fun-filled evening that supports a great cause – the local farming communities of Waupaca, and Outagamie, and Shawano counties. Watch highlights from last year’s event. • $25 in advance: In-person (see event flyer for locations) or online*. * NOTE: $2.00 convenience charge applied to each ticket purchased online. • $30 at the door (event night). We accept cash, check, or debit/credit. Convenience charge applies to electronic payment. Event Flyer: Click HERE (pdf) to check it out, download, and send to a friend. 2016 Event Sponsors: First State Bank • Milk Source • Waupaca Dairy Promotions • GreenStone Farm Credit Services • Dr. John Mielke Family • Outagamie County Dairy Promotions. NEW this year! Quesadilla Cook Off. 3 teams will compete to win your vote of BEST quesadilla recipe. Silent auction. Be the highest bidder to take home our one-of-a-kind items. Green Bay Packer autographed footballs, local sports tickets, and hand-crafted wooden items. Every 10! Sponsored by local individuals and businesses. Play for a chance of winning $100 every 10 minutes. Money Tree. Sponsored by Premier Community Bank. Win $200. Gather up some friends and join us for a evening of fun. All (100%) proceeds go directly back into the Rural Health Initiative to provide complimentary Kitchen Wellness to local farmers, agriculturists, agronomists, and anyone else who contributes to agriculture within Outagamie and Waupaca, and Shawano Counties. Don’t delay to get your tickets. Last year’s event sold out in advance, before doors opened! Join us for another fun-filled evening that supports a great cause – the local farming communities of Shawano, Waupaca, and Outagamie counties. • $32 online. Click HERE or click RHI Store above. • $40 at the door (event night), until capacity is met. We love the new look and hope you do, too. Thank you to the creative souls at Cooperative Resources International (CRI) in Shawano for the fresh look. Sending a BIG THANK YOU to our 2016 Event Sponsors: Green Valley Dairy • United Cooperative • Ardex All American Minerals • Shawano Area Dairy Promotions • Dr. Beth Gillis • Dr. John Mielke. Entertainment sponsored by Jeff Betley Farms. Every 10! Sponsored by local individuals and businesses, a $20 gets you into the drawing for a chance to win $100 every 10 minutes from 8:30p – 9:30p. Gather up some friends and join us for a evening of fun. All (100%) proceeds go directly back into the Rural Health Initiative to provide complimentary “Kitchen Wellness” to local farmers, agriculturists, agronomists, and anyone else who contributes to agriculture within Shawano, Outagamie and Waupaca Counties. Event flyer (pdf): click HERE. Community Action for Healthy Living (CAHL), Rural Health Initiative (RHI), and the Community Health Improvement in Action (CHIA) projects of Outagamie, Brown and Calumet Counties are teaming up to provide an educational event for community-minded individuals and organizations. RHI Kitchen Wellness – Learn how the Rural Health Initiative provides preventive free health screenings to Outagamie and Waupaca’s agricultural community Public is welcome. Meet and network with local legislators and communityminded partners on critical topics that affect us all. Join us for local food and beverages, horse drawn wagon rides, live musical entertainment by Brad Emanuel, and variety of silent auction and bucket raffle items. A delightful event at a gorgeous venue, Willow Springs Garden. Come enjoy the scenery while socializing with like-minded community members. Access to five delicious food stations featuring local food. Stations include meat ka-bobs, smashed potatoes, fresh vegetables, a variety of local cheeses, and dessert. Complimentary horse drawn wagon rides. Don’t miss this opportunity to see the newly renovated round barn! An impressive selection of silent auction and bucket raffle items. 50 chances to participate in the Wine Pull. Everg participant wins a bottle of wine! For immediate questions, contact Project Manager Gail Kell at gail@rhiwi.org. 100% of proceeds stay local and benefit Rural Health Initiative – Marathon. Additionally, United FCS has graciously agreed to match all proceeds, up to $10, 000. Athens Veterinary Service, Carpet City, Central Wisconsin Evergreens, Dr. Tiffany Ludka-Gaulke, Marathon County Farm Bureau Young Farmer and Agriculturist, Johnson Creek Dairy, Misty Hollow Farms, Peter Trucking & Peter Grain, Rural Insurance, Thrivent Action Team, Cherokee Garage Inc., and Pagels Pub and Grub. Al and Jeani Maszk, Big M Acres, Marathon Feed Inc., Nueske’s Applewood Smoked Meats, Van Der Geest Dairy, Vine Vest, Swiderski Equipment Inc, Zebro Realty, LLC, Country Fresh Meats, Mia Beyer, Dennis & Antonina Olszewski, and Bledsoe Cheese, Inc.
We’ve been fortnuate to receive an abundance of in-kind support, as well. Each donation, whether financially or volunteerism, is greatly appreciated. A complete list of in-kind sponsors will be listed in the event booklet. $25 – In Advance (Cash or Check, thru 4/23). Complete and mail the bottom portion of event flyer to RHI with payment. RHI will notify you if your tickets will be mailed to you, or reserved at the door. $27 – In Advance (Online w/ Debit or Credit, thru 4/23). You will receive an e-ticket. Print and bring with you to the event. Fri, 4/24 (Event Night) – No online sales on day of event. Click Contact Us or call 715-524-1488 if you have questions. 100% proceeds go directly back into Rural Health Initiative to provide preventive health screenings within Shawano, Outagamie, and Waupaca counties. No refunds, billings or transfers. Photo and Video Release: The Rural Health Initiative (RHI) often takes photographs and video during our events for use in brochures and on the Web. By registering you agree that the RHI may use any image of you that might appear in photographs or video taken at a RHI event. The UW-Extension and Rural Health Initiative are proud to co-sponsor this farm family health & business management conference. COST: $30 per ticket (in advance); $40 (at door, on night of event). Click Contact Us today to reserve your tickets. Join us for this complimentary event featuring guest speaker Ben Brancel, introduction of staff and an overview of program services. A light lunch will also be served.